Our season opens with a unique opportunity to experience the world-class Pavel Haas Quartet performing in the intimacy of the Holywell Music Room. Renowned for their outstanding performances and award-winning recordings, they will play two highly expressive works, Tchaikovsky's Quartet no. 3 and Beethoven's Quartet op.59 no.3. This concert brings a welcome return visit by Nicholas Daniel, one of the world's great oboe players. Accompanied by a string ensemble of his friends, he will perform an attractive and informal programme of works by Mozart and 20th century English and French composers. It promises to be interesting and engaging afternoon. 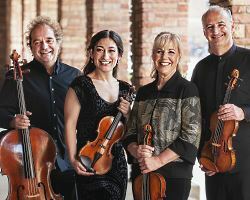 Firmly established as one of the leading string quartets of its generation, the Doric String Quartet receives enthusiastic responses from audiences and critics across the globe. They will be performing Haydn's popular Joke quartet, Sibelius's Intimate Voices quartet, a contemporary work and the first of Beethoven's much-loved op.18 quartets. 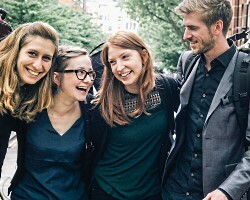 The Atéa Quintet is one of the foremost British Wind Quintets. Internationally acclaimed, they became double prize winners at the 2015 Carl Nielsen International Chamber Music Competition and are Associate Ensemble in Residence at the Royal Birmingham Conservatoire. 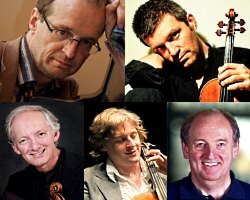 They will be playing a diverse programme of delights including music by Bach and Nielsen. 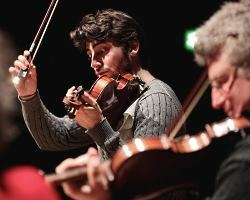 The Maggini String Quartet has long been a favourite of Oxford audiences and continues to be much admired by chamber music playing enthusiasts. We're delighted to host the Maggini at the Holywell Music Room again in a programme that includes Haydn's Lark Quartet, Schubert's magnificent G major Quartet and a work drawn from the English quartet repertoire that the Maggini have very much made their own. Flauti d'echo is a truly outstanding young recorder duo who are joined by leading early music players in a programme that celebrates the arrival of spring with music by Monteverdi, Purcell, Handel, Vivaldi and others. Cheeky cuckoos, blossoming flowers, dancing shepherds and buffeting winds frame a beautiful pastoral aria, 'Awake, Thou Wintry Earth', by J.S. Bach. The highly accomplished pianist and chamber musician Alasdair Beatson is joined by a quartet of his friends, all leading string players, in a festive finale to the season which will include Dvorak's lovely D major Piano Quartet and Schumann's magnificent Piano Quintet. The splendid (Benjamin) Frith Piano Quartet with guest double bassist, in a programme of pure enjoyment. We all know the Trout Piano Quintet by Schubert, but how many of us know the piece which prompted its composition, the E flat Piano Quintet by the most popular composer of the time, Johann Nepomuk Hummel? Between this interesting pairing we'll have the delight of Beethoven’s Opus 16 Piano Quartet. Endymion's members are no strangers to Oxford's music lovers and they number among the best soloists and chamber musicians in Europe. For us they perform two much-loved chamber works for clarinet and strings. Martinů's approachable but distinctive chamber music should be heard more often. His Three Madrigals for violin and viola were inspired by Mozart's Duos and they draw on the Bohemian-Moravian folk themes and dances of the composer's roots. This young prize-winning quartet is dedicated to exploring and recreating the sound-worlds of the Classical and early Romantic string quartet repertoire through period instrument performance. This is a programme that ranges from the sensual to the sublime. 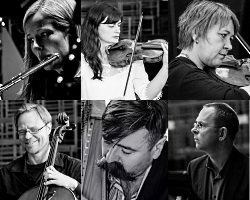 It's performed by a versatile and flexible ensemble which includes some of the cream of London-based musicians. Marking the centenary of the death of Debussy, the music includes his three late sonatas in which the dying composer defiantly upheld the French tradition in time of war. These are contrasted with two Mozart favourites. Always on the look-out for the best of the new, we are delighted to bring to Oxford Ensemble Mirage. We can expect splendid performances of some of the most enjoyable music in the repertoire. 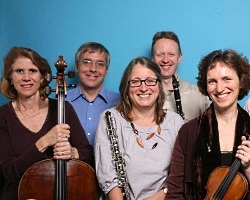 Ensemble Mirage was founded by the clarinettist Matthew Scott and the violist Ugne Tiskute. In these pieces we will hear melody and the pungent timbres of wind and string instruments dancing and singing together, brought to us in all its freshness by these brilliant young musicians. It's a fair bet that any lover of chamber music will list the Tákacs String Quartet amongst the world's finest ensembles so we're proud to be able to include them in our 120th season, and with what a programme! This well-known Mozart quartet is another of those he dedicated to Haydn. 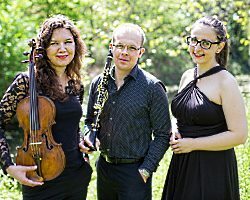 Shostakovich's Fourth Quartet incorporates Jewish folk influences - it had to be hidden away until it was safe for performance. The Mendelssohn F minor Quartet journeys in a darker world than his audience expected but we now know it as his late masterpiece. Founded in 1953 and over the years refreshed with the very best musicians, the Allegri has become an integral part of British musical life. Programmed are two of the greatest quartets in the repertoire, sandwiching a lesser known masterpiece of the 20th century. Mozart's Dissonance quartet, one of six dedicated to Haydn, is, after the brief 'dissonant' introduction, one of his most cheerful chamber works. Szymanowski's Second Quartet is a personal summing-up by a still underestimated master: the first of the three movements is highly impressionistic and the last two derived from Polish folk music. Beethoven' opus 127 is the first of his celebrated late quartets, a work of significance not only within that context but also in the ongoing development of the quartet oeuvre.